Fresh wild greens are possible although completely uneconomic for us to supply because of the food miles. Prices here are as a guide. Saltbush fresh 500gm $28 (generally all year round) The large fresh or blanched Saltbush leaves can be used as a wrap around meat or fish, in salads or as a leafy bed for grilled meat or vegetables. Warrigal Greens 500gm fresh $32 (generally all year round) The large, lush leaves can be used instead of Spinach and treated in much the same way. Great in Quiches, with pasta, stir fries and as a steamed vegetable. Samphire 500gm fresh $33 (Sept through to March) This Aussie Sea Asparagus can be used steamed, stir-fried or blanched. Is a great complement to seafood dishes. River Mint 250gm fresh $21 (May to August) This is a subtle Australian native herb with the taste and aroma of spearmint. Karkalla Beach Banana 1kg fresh $54 This juicy, sausage shaped leaf, harvested on a trailing stem, is great in soups, stir-fries and pickles. Crystal Ice Plant 500gm fresh $27 This green succulent annual ground cover has huge succulent leaves in Spring, with glistening bubbles of salty surprise on the underside of leaves and stems. In Summer the leaves turn to a small grey form with attractive pink flower buds and white flowers . These flower buds are much sort after by chefs as edible decoration . Can be used steamed , stir-fried or blanched. Is a great complement to seafood dishes. 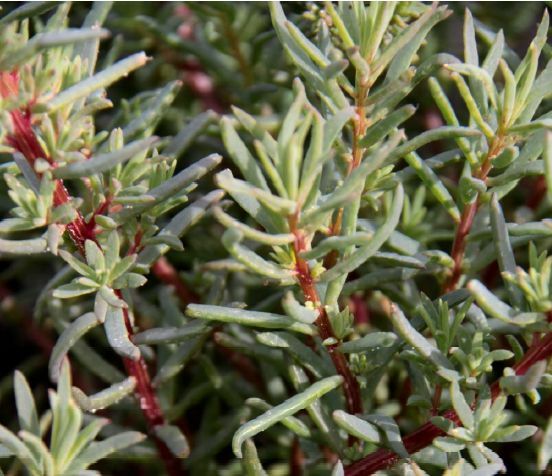 Coorong Seablite 500gm fresh $29 This green fern-like succulent perennial shrub has rich red stems and ref foliage during autumn. Barilla Bower Spinach 500gm fresh $28 The small, lush leaves on tender trailing stems can be used instead of Spinach and treated in much the same way. Great in Quiches, stir-fries and as a steamed vegetable. The whole stem with small leaves is particularly good in Tempura batter. Munyeroo This juicy leaf and thick stem, is great fresh, steamed or in soups, stir fries and pickles. The thick pinkish stem has a similarity to tender asparagus.